For millennia humans have been directly responsible for their own life expectancy and the preservation of their health. We ate only as much as needed, had a diet directly from our immediate surroundings and took care to stay warm and dry, causing the minimum amount of harm to the body. Over the last few centuries of change and plenty this instinct for self preservation has altered. The average person no longer lives according to what is good or bad for their body, but rather on a collection of beliefs and desires formed by the media and education. We have forgotten how to take care of ourselves. It is now important to revisit our natural state, one of listening to the internal voice of our bodies, and an important part of our physical and spiritual development. Recently when visiting the USA, I watched three very overweight people taking plates from a restaurant buffet. Each had about two day’s worth of food and huge glasses of iced soft drinks. Their heads were bent for hours, eating steadily, as if it were a competition of endurance. Their bodies were not being listened to. Although I found this disturbing to watch I remembered a time when I also heard nothing from my body and did not understand or speak its language. Eating and drinking was something almost out with my control that I did automatically and without thought. I remember being cold or wet and unconcerned, or walking barefoot on cold floors without thinking twice. This was before I learned to listen. In other parts of the world there is a traditional awareness which has not yet been changed by the modern world. In China when sitting on cold stones people would shake their heads disapprovingly and tell me that I was damaging my ovaries. 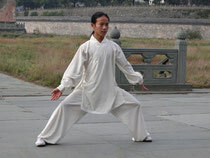 My martial arts teacher saw me without slippers in winter and could not believe I did not know it was bad for my kidneys. Drinking iced drinks in the heat of summer was met with strange looks and remonstrations that, as my grandmother always said, cold fluids are detrimental to the stomach and kidneys. At first I thought these things were a cultural difference between east and west. However, as time went by it seemed more like common sense that we had simply forgotten. It appears to be caused, at least in part, by our society’s modern tendency to generalize what is “good” or “bad” for us. We hear constantly what we “should” do for our sleep, our skin, for weight loss, cancer prevention or heart disease. The media tells us to eat more oily fish, drink more green tea, eat less meat, incorporate more antioxidants into our diet or do a certain number of hours exercise each day. But one’s diet is personal and each body is different. The Chinese say “he that takes medicine and neglects diet, wastes the skills of the physician”. The west has become a society of medicine takers. We do not even consider maintaining body temperature or diet to be related to becoming sick when other cultures regard as it the foundation of good health. Diet and life management are in fact medicinal and should be our first port of call. The good intentions of the government in generalising rules for health have in fact taken us further from that goal. How can there be one correct answer for everyone’s body? With so much food freely available one must listen and experiment with the body to build a relationship, rather than a habit. The body’s systems are not fixed and change on a day to day basis as well as week to week and summer to winter. Treating every day as the same is a modern phenomenon. People have become reliant on having three similar meals seven days a week whereas our clothing, amount of sleep, type and intake of food have historically varied with both the season and the activities of the day. The confining of our lives into an unchanging ‘nine till five’ pattern means that we stop listening and follow convenience rather than hunger or natural cycles. This lack of interaction with the body is a widespread problem that reaches throughout society. There are also those involved in physical/spiritual disciplines and the holistic arts guilty of organizing their lives and practice entirely from their heads, with no input from the body at all. I have met yoga teachers who starve themselves of nutrition and warmth with the obsession of a raw food diet, who drink cold water because it ‘burns calories’, or who insist on hours of ashtanga practice when their body is clearly crying out for rest and relaxation. It is very easy to follow the mind, which likes to gather knowledge, set goals and targets, plan in advance and have routines. Our success depends on moving beyond this. In taking care of ourselves we must follow the language of body and the day as it unfolds; which takes honesty, awareness and trust. At first you must push yourself to listen to the effect of each action on the body. But after a while there is a change, the body begins to push you, to let you know what will take it to a level of health you never thought possible. In this way we can feel a connection to our ancestors and the thousands of years of human presence on earth. Life is not a certainty, something that we get to keep no matter what. Our quality and length of life, our longevity, is dependent on the amount of care we take in being alive.